With budgets tight for many of the Windham community, foods like this, which we take for granted and also as a right of summer, would not be possible for as many as three hundred families in our community. But the Windham Food Pantry, working in collaboration with the Windham Community Garden, make these foods available to many. Every season Madeline, director of the Windham Food Pantry, works closely with the Windham Community Garden members; first in advising what to grow according to nutritional needs and desires of the clients and then in receiving and storing the produce for distribution. The Community Garden devotes fourteen beds to producing an abundance of food from beans and tomatoes, to cucumbers and several types of squash and more just to make it all possible for the most vulnerable in our community to have nutritious, fresh produce.. Without the collective approach of all the active members of the invested community garden team and their association with Madeline at the pantry none of this would be possible. Yet let it be said that working as a team all the members of the community garden members take not only their plots to heart, but also those devoted to producing the myriad of vegetables that it takes to supplement those in the Windham community that would have to go without, were it not for this relationship. There is first the need to balance the need with space and then the real hard work gets underway as the designated plots are first prepared and then planted. The work load doesn't stop there as the weeds and insects make their attacks to only find a willing team waiting to do whatever needs to be done using only organic principals to address any problems that may arise. Watering is a summer long responsibility that all the garden members are will to share to bring their pantry plots to fruition. After all the work the harvest begins and the smiles grow with the reminder that last season more than 2,100 pounds of produce walked the few feet from the garden space down to the pantry just a short distance away on Gray Road, Route 202. The next time you walk to your summer garden for something special for dinner remember that with your continued support many more people are enjoying the same. 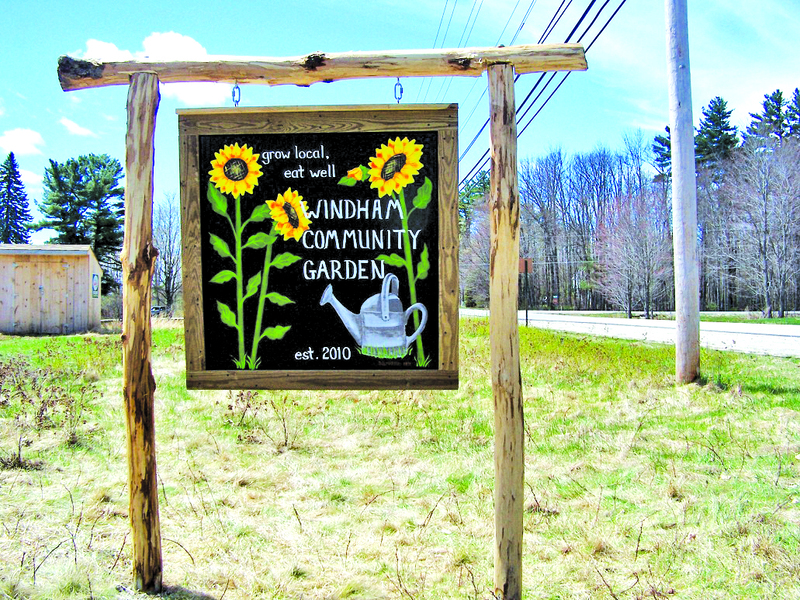 So go ahead and pick your greens and then your tomatoes and cukes; smiling the entire time because with your help and the help of numerous others throughout the Windham community a lot of people can do the same. 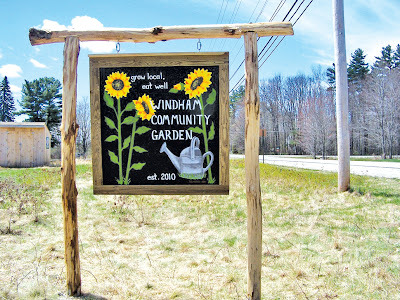 With special thanks from the Windham Community Garden and the Windham Food Pantry and its director Madeline; eat and enjoy, we couldn't do it without you. Enjoy a day outside at Dundee Park. It’s affordable and it’s local! Bring your family and enjoy a picnic, cool off in the river, play some basketball or just sit and relax and enjoy the natural surroundings. Dundee Park is open for the season on a daily basis through Labor Day weekend. Check out the new addition to the park, an updated bath house and new handicap ramp. The 2013 fees have stayed the same as 2012. A family pass for Windham residents is $45.00. A pass will allow you and all the people in your vehicle, 15 passenger maximum, for unlimited visits during the season. Daily fees for residents are $4 for adult and $2 for a child. For non-residents it’s $5 for an adult and $3 for a child. Dundee Park is owned and operated by Town of Windham and is located off Presumpscot Road. The park phone number is 893-2415 during park hours, which are 8 a.m. to 8 p.m. Passes are available at the Windham Parks and Recreation Office at Town Hall, 8 School Road, or they can be purchased at the park during park hours. For more information please call the Windham Parks and Recreation Office at 892-1905 or visit our web site at www.windhamparksandrec.com or check Dundee Park on Facebook. Enjoy a local outing in your own backyard at Dundee Park. Celine Baker, a Windham Middle School eighth grader, is preparing for her first pageant competition. 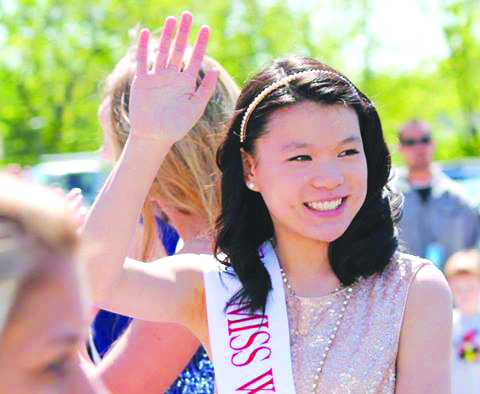 She will vie for the title Miss Maine’s Outstanding Teen in June. Celine balances a full schedule of theater, singing, dancing, soccer and pageant preparation. She is working hard to prepare and has her eye on a win, but says the experience will yield benefits that go far beyond the pageant itself. “I have ambitions to be a lawyer and to go to Harvard Law. The experience and knowledge [from the pageant] will help me apply for jobs, build confidence and a better outlook on brightening our future,” said Celine. Sitting in the kitchen of her family’s Windham home, dressed in a bright pink cardigan and with her hair pulled back on one side, Celine speaks thoughtfully and confidently as she explains her journey toward pageant competition and the rewards she hopes to gain from it. Celine’s platform is called “Bye Bye Bullying.” “I want to try to start clubs in schools, to have kids make up kid counseling teams. Most people respond more to their peers,” she said. 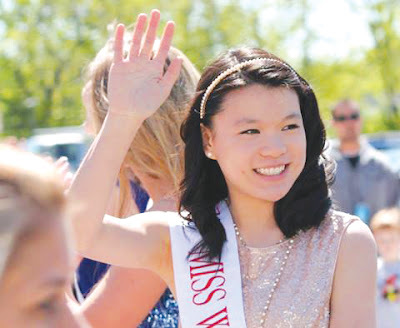 If she wins the state’s outstanding teen title, the pageant program will help her promote her planned program in schools throughout the state, she said. “I’ve seen a lot of my friends get bullied. I’ve seen it in school. I’ve been bullied. Nobody should experience the pain and suffering I did and many others around the world do,” said Celine. The Miss Maine’s Outstanding Teen pageant offers scholarship money and requires students to be in good academic standing, said Celine. A win would have Celine compete to be named Miss America’s Outstanding Teen in Florida this coming August and give her the opportunity to push her platform, become a role model and speak out, she said. Pageant week begins June 18. During the week, contestants train, rehearse and perform community service, said Celine. She anticipates some nerves as the day of the event approaches, but says she feels confident in her preparation. Singing will be her talent when she takes the stage. Celine is being coached by Windham High School senior Marybeth Noonan, who won the title two years ago, and by voice coach Janelle Losciuto. The contest includes optional workshops for contestants, said Celine. “It’s to help build up contestants’ confidence,” she said. She’s already attended one on interviewing. “I think I did pretty well. There are three judges and someone recording it. They asked questions about me and my platforms,” said Celine. “The feedback was really helpful. They said I needed to work on adding more depth to my answers,” she said. There are a few more workshops scheduled between now and the pageant, and Celine plans to take advantage of them. “I’m hoping to win, like every girl is, but I’m not shooting for that 100 percent. I’m looking for a different experience, learning something and meeting new people,” said Celine. As temperatures start to warm up, people will migrate to outside activities. Yard work, baseball games, beaches and fun in the sun among the spring and summer activities we jump into after a cold, hard northeastern winter. The benefits of the sunny, vitamin D, fresh air, and increased physical exercise are instrumental for good physical and mental health, yet come with the risk of over heating and dehydration. Heat stroke is a condition that can happen when a person’s body gets too hot. Most often heat stroke happens when people exercise in very hot and humid weather without drinking enough fluids. When people get hot they can also get “heat cramps” and “heat exhaustion”. These are not as serious as heat stroke, but can lead to heat stoke if they are not treated properly. If you or someone you are with develops “heat cramps”, painful muscle cramps or “heat exhaustion” headache, dizziness, nausea or vomiting you should cool your body down right away to prevent heat stroke. Cooling down safely includes moving to a shady or air-conditioned area, drinking water or a sports drink (NOT alcohol or caffeine), remove extra clothing, cold cloth on your neck or a cool (not ice cold) shower. If your symptoms do not improve or get worse you should seek immediate medical attention. Prevent overheating by taking breaks when you exercise or work outside, drink plenty of fluids (especially water or sports drinks), exercise or work early in the day before it gets too hot outside and wear loose light weight clothing. How much water is enough? There is no easy or precise answer. Everyone’s bodies are different (metabolism, activity level, etc). It is widely accepted to take in a minimum of eight 8-ounce glasses of liquids per day, thus with outdoor activity and heat that should be increased. The best measure of whether you are getting enough fluids is in your urine. Urine should be a light yellow to clear, if not drink up! It's never too early to plan. Now that the first planting of peas and lettuce are in, it’s time to look elsewhere. With notebook and pencil in hand, write down chinonodoxa and snow drops. These are among the first things to bloom and scilla with the sky blue flowers will welcome any spring perennial border. These are perfect when planted with Vinca minor. Write them down, think of where you will plant them in the fall. Vinca loves the shade and when you really try you can get something more than just blue, purple or white. The everlasting fall planted bulbs will be purchased in the fall for next season’s first blooms. Now is also a time to think of other perennials like the myriad of Day lilies, not the ever blooming orange fulva cultivars, not the yellow Stella Doro that we see too much of, but the reds, and whites, as well as the purples and pinks that we will talk about later in June. Think about the other additions to your perennial borders, for yes, it is possible to have perennials in bloom even here in Maine from March to November. Some attention also needs to be given even this early to some of the culprits that will try our wits as the season moves on. The slugs that we detest so strongly have started to develop so be on guard. My infestation was so bad last season that this year I will start off with something stronger than salt or dry wood ashes. This season I will start off with a selective application of a pest control called buggetta pellets that will quietly bait and destroy the ravenous slugs long before they get out of hand. Yes, we want to stay organic yet sometimes we need to carefully use something a wee bit stronger. For me this season I have no other choice but to play their game better than they can. Buggetta bait will target only the slugs, and it is safe enough to use so that there is no secondary kill, even if the birds or the neighbor’s cat should eat the sickened slugs nothing will happen to them. This old time chemical remedy will be used only this once, this season to bring them back under control, then no more for years to come. Now is also the time to get on your first application of fertilizer like a well balanced application of 5-10-5 or an application of 10-10-10 depending on your needs. If soil acidity is a problem an application of dolomitic lime should also go down. The lime will do its job along with the fertilizer with no interaction as long as it is dolomitic and not hydrated or pelletized. Yes, it’s cool and yes we may still see frost, but don't worry, it will have no effect on your carefully planned garden, and yes your garlic is up and growing. The indoor seeded tomatoes and peppers should still be doing well inside, either on a sunny window or under grow lights. When the weather warms a bit we will talk about hardening off your tender vegetables when warmer weather gets closer, but for now water your seedlings well when needed and keep going. Too add a bit of color here and there get some locally grown pansies, but please ask, if they are hardened off before you begin. If they haven't been hardened off go elsewhere and maybe even pay a bit more. You will always get what you pay for when we support our local growers, not the big box stores that will entice you with nothing more than lower price pansies from either down south or direct out of a greenhouse without any preparation for our cooler weather. Plant more peas and lettuce for continuous harvests and keep going and prepare for your best season ever. Summer’s on its way. Wondering what to do? Check out the activities offered at Windham Public Library. Can you find the chicken? If so, get a small prize. Want to show off your pet? Check the calendar for the date. Do you enjoy art? Share in the craft activities planned for children. Want to meet an author? Brenda Reeves Sturgis is coming. How about an illustrator? Scott Nash from Peaks Island who designed the nationwide art for “Dig Into READING!” will be at the library on June 27. Do you like scavenger hunts? Form a team and seek out some interesting objects, bring them back to the library and everyone on your team receives a prize. Are ice cream sundaes up your alley? Celebrate with a concoction you make yourself as the last day of July arrives. Like prizes? Amazon, Walmart, Corsetti’s, book bag, memo cube might all be yours just for taking part in Teen or Adult Bingo. Teens, do you like to read and review books? Share what you like (or don’t like) by writing a review to get another chance to win a prize. Have you ever wanted to try yoga with your children? Learn some basics one morning in August with Rebecca LaWind. Want to try out the adult book group? They meet on the last Tuesday of June, July and August. How about building community? Join us for tea on Tuesday, July 16 and August 13. Need a little magic in your life? Peter Boie will present Magic for Non-Believers on Monday, July 22 at the Windham Middle School gym. When was the last time someone read out loud to you? All listeners are invited to come to the Children’s Room on Tuesdays at 11am for a half-hour reading by Mrs. Currier or Mrs. Parker. Looking for something to wrap up the whole summer before school starts? There’s a “Dig Into Reading” Carnival on Thursday, August 22. Oh, and remember to pick up a good book or movie when you are visiting. A calendar of all events is available at the library and will be posted at www.windham.lib.me.us.